The Signature Safari page for 2011 had been put up and blank for a few days. 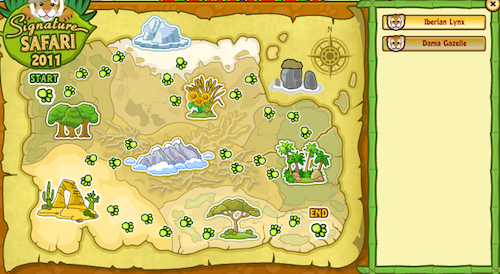 It now has the first Signature Endangered animal map for 2011 up... and it is listed as the February pet, the Dama Gazelle! However, if you click on the questions, they all relate to the January pet, the Iberian Lynx! So the questions are the correct ones, but the trivia has been mislabelled as next month's pet, as you can see in the screenshots below. Just a little Oops! for Ganz. Last edited by alleine; 01-05-2011 at 02:24 AM.. Reason: Adding screenshots. Hmm, good catch! When I go to that page, the list of animals is blank. I can click back to the 2010 animals, but the 2011 column is blank. Last edited by kayjay; 01-06-2011 at 10:07 PM.. Yes, the day after I did the Safari, it had been removed! Perhaps I stumbled upon a programming glitch? Did anyone else on WI manage to do it before it disappeared?? No name for either the January OR February pets. Looks like Ganz's Oops is getting bigger! Last edited by alleine; 01-09-2011 at 07:01 AM..
Hi Alleine! I think you are absolutely right, you stumbled upon a glitch! I do feel better that it's not just my accounts, I was thinking that maybe I had to complete the polar bear questions in 2010 before I saw the 2011 questions, but I don't think that is the case after seeing your post. Maybe it will get fixed with next Wednesday maintenance which I think is tomorrow.. I like the safari questions, because it's a quick 300kc, especially if you have multiple accounts, you can make all the mistakes on one account and then get perfect scores on the others. Maybe you'll get to do the quest twice, if they just wipe it out and reload it. Who knows! Now we're already halfway through January and they haven't managed to get the Iberian Lynx back up there at all! But I suspect since my pawprints are still highlighted on the 2011 page, it will know I've done it already (IF it returns!!!). They still haven't added the Iberian Lynx questions back, and we past the middle of January! Obviously this glitch was not a high priority one for them, but it's been almost 3 weeks now since the beginning of January. Will we have any Iberian Lynx questions again during the month of the Iberian Lynx?? The iberian lynx questions are back! I haven't done them yet, I'll report back it they are fixed. The (actual) Dama Gazelle Signature Safari question set is visible on my account. Anyone else?